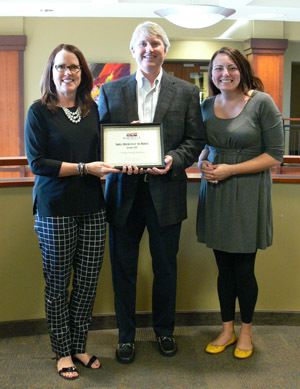 We are pleased to honor Vickery Family Medicine as Small Business of the Month. Read on for our interview with Dr. David Vickery and Administrative Director Margarita Gonzalez. Tell us a little about the history of the company. Vickery Family Medicine started in the fall of 2005 with one doctor, two staff and a small leased space. Today, we have 2 physicians, 5 mid-level providers and 20 staff. We are one of the first practices in our region to participate in patient-centered medical home models and to partner with insurers to enhance quality of care. We remain an independently-owned and operated comprehensive primary care practice that is open 7 days a week to serve our customers. We currently provide comprehensive primary care, full spectrum urgent care, weight management, nutritional health and provide direct primary care services to individuals and businesses. We are most proud of the team of people working together every day to give our patients the best resources for their health available. We have a passionate, hard-working, inspired group of people who are dedicated to excellence in delivering care and committed to how we steward our patients’ health care dollars. I am certainly proud of our growth and the jobs created and the number of patients we serve, but I am most proud of the people I work with every day to make it happen. A little known fact about your company? For 3-1/2 years Vickery Family Medicine has operated a comprehensive primary care clinic for the Biltmore Company. It has served their employees on-site and has substantially reduced the cost of delivering health care for the company and the cost of worker injury issues while providing consumer-oriented, outstanding care. Vickery Family Medicine has also been voted a best family practice three times by the readers in the MountainX Best of WNC poll. Best advice you have gotten for leading a small business? Identify what you are passionate about and what you do best. Write down the plan of how you can create value with that service to the community that you plan on operating within. Set goals and make sure that they are on paper and surround yourself with the best possible people who help you execute your vision. Make sure you measure yourself quarterly and yearly to make sure that you are staying on track given the plan that you have formed. Stay focused on what you are best at doing and make sure that whatever product you are delivering will be valuable for the community you serve. Have a clearly- articulated vision statement and regularly meet with your employees to make sure they share that vision and can express it. Many things! Namely, growing our primary care practice by adding more providers and physicians, thereby being able to serve a greater number of individuals; expanding the services that we offer (including ultrasound, radiology services, sleep services and the ability to triage emergencies to reduce the need for our customers to spend time in emergency departments or hospitals). Simultaneously, we plan on partnering with retail deliverers of health care as well as offering direct rates and care products to business entities, self-insured entities, fully-insured entities and individual consumer. This will ensure our community has access to affordable, excellent comprehensive primary care and urgent care services. We’re also working with insurers to collaborate on new health care delivery models that will hopefully bring plans to the marketplace and the small business that are more affordable and provide more comprehensive coverage for their employees. Our tagling is "Connect. Engage. Impact. Thrive." What does this mean to you as a small business in Asheville? We hope to connect directly with our customers, but more importantly to begin to build connections between healthcare businesses, non‑healthcare related business entities who insure their employees, and health insurers to build positive collaborations that allow everyone to get more affordable accessible comprehensive healthcare. Getting all of these partners at the table together to positively collaborate on the solutions is a challenge, but will help create a community where our businesses thrive and our individuals enjoy good health. We believe that healthcare will always be an individualized art, even with evidence-based scientific practices. The only way that our work will be effective is if we are able to intensely engage with the individual patients in a manner that engenders trust and confidence and inspires them to invest in their own health. In doing so, we hope to be a part of enhancing community and population health, which will reduce healthcare cost, reduce injury and improve productivity. We also hope that we will be able to engage directly with businesses, bring transparent pricing to healthcare delivery and the outpatient sector, and help businesses be able to have access to products that are affordable and effective. The end result of this would be a significant impact on the health of our community and the health of our businesses. By providing these type of services and reducing the cost of care, businesses will be able to invest more in not only their employees, but in their products and services and be poised to compete in their particular sector with a healthy and cared-for employee base. We believe that the healthcare models we are passionate about can provide the business community and our individual population with the healthcare resources they need to thrive. We have national data that proves that when businesses, healthcare providers and insurance entities engage in this positive collaboration that the health and economic metrics are extremely positive. We have local data with our local business that supports this as well. We are excited about the future of our business and the future of our region.